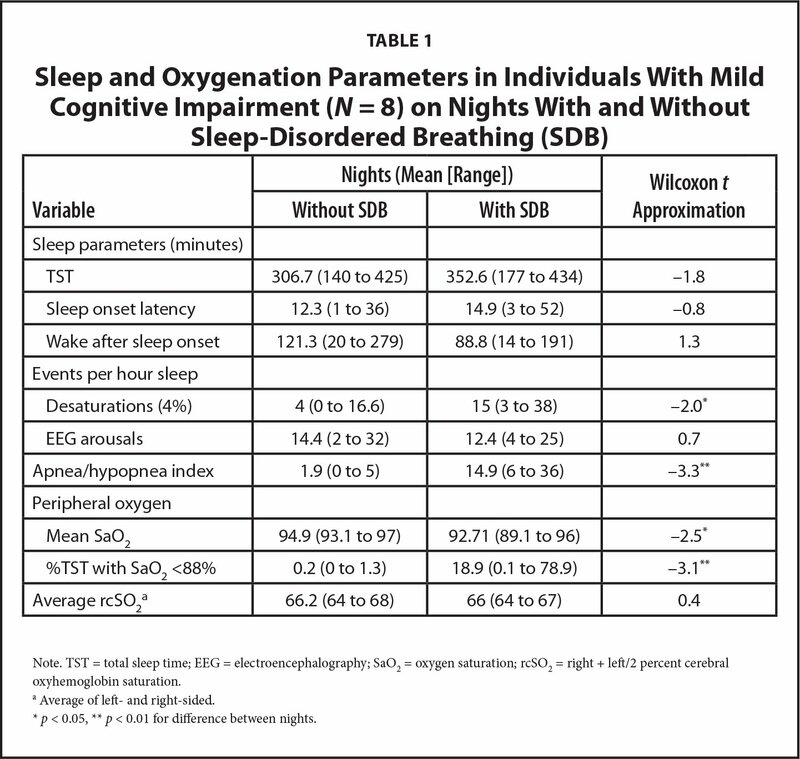 The current study examined relationships between laterality in cerebral oxygenation (L-COX), sleep-disordered breathing (SDB), and daytime function in 16 adults with mild cognitive impairment (MCI). All participants underwent two nights of diagnostic polysomnography. Using dual-cerebral oximetry, L-COX was defined by differences ≥4% in right- versus left-sided percent cerebral oxyhemoglobin saturation. Eight patients had SDB. L-COX was found in five patients, but only on nights with SDB. Greater L-COX was associated more severe SDB: higher frequency of apneas + hypopneas per hour (r = 0.66, p < 0.01), desaturations per hour (r = 0.73, p < 0.01), and percent time with oxygen saturation <88% (r = 0.65, p < 0.01). Greater laterality, but not severity of SDB, was associated with poorer functional ability (Lawton Instrumental Activities of Daily Living Scale: r = −0.83, p = 0.02), lower cognitive function (Mini-Mental State Examination: r = −0.76, p = 0.03), and greater daytime sleepiness (Epworth Sleepiness Scale: r = 0.85, p < 0.001). L-COX associated with SDB suggests disruptions in cerebral autoregulation and need for aggressive treatment of SDB in individuals with MCI. As a neuroprotective intervention, continuous positive airway pressure (CPAP) and other noninvasive modalities designed to stabilize breathing during sleep are probably the easiest and safest interventions to initiate in individuals with mild cognitive impairment (MCI). Compared to pharmacological interventions, these therapeutic modalities have a low risk of drug interactions. In individuals with dementia, improvements in function have been reported within weeks of continued use (Ancoli-Israel et al., 2008; Cooke et al., 2009). Epidemiologically, sleep-disordered breathing (SDB) is a strong predictor of MCI and dementia (Ding et al., 2016; Leng, McEvoy, Allen, & Yaffe, 2017; Osorio et al., 2015; Yaffe et al., 2011), and treatment with CPAP appears to delay the age of onset of MCI by several years (Osorio et al., 2015). At least two studies show that SDB is a strong predictor of lower cognitive function in MCI (Kim, Lee, Lee, Jhoo, & Woo, 2011; Terpening et al., 2015). However, evidence supporting the immediate effectiveness of CPAP and other noninvasive therapies on cognitive function is conflicting (McMillan et al., 2015; Weaver & Chasens, 2007) in adults without dementia and yet to be determined in individuals with MCI. From the perspective of precision medicine, these inconsistent findings of the effectiveness of CPAP in older adults with SDB point to the need for predictive clinical biomarkers for evaluating therapies aimed at protecting the brain from hypoxic injury. SDB is known to cause disruptions in cerebral blood flow (Balfors & Franklin, 1994) and upwards of one half of individuals with MCI have comorbid conditions that limit vascular support for neural processing (Delano-Wood et al., 2009; Wallin et al., 2016; White et al., 2016). In addition, brain metabolism remains unchanged or increases across the lifespan, whereas cerebral blood flow, particularly in the frontal lobe, decreases with age but is a prominent feature of SDB (Baril et al., 2015) and in some forms of MCI (Roquet, Sourty, Botzung, Armspach, & Blanc, 2016). The current article presents findings that suggest a link between disruptions in cerebral blood flow during sleep, as measured by laterality in cerebral blood flow within the frontal lobe, severity of SDB, and clinical symptoms (cognitive and behavioral) in individuals with comorbid MCI and SDB. MCI is a neurological syndrome that represents a transitional state between normal aging and dementia. Clinically, MCI is defined by a decline in one or more cognitive abilities, the severity of which is greater than expected for an individual's age and education, but with preservation of instrumental activities of daily living (IADL) (Petersen, 2007). The prevalence of MCI in samples of individuals without dementia ranges from 12% to 18%, and approximately 50% of cases progress to dementia in 5 years (Bennett et al., 2002). This relatively long prodromal period provides clinicians an opportunity to introduce treatments at a time in the disease trajectory that may slow or reverse the damage to neurons and thus minimize the severity of clinical symptoms and progression to dementia. Relevant to this research, vascular pathology is present in many forms of dementia, and when present, is predictive of worsening of symptoms (Snowdon et al., 1997; Wallin et al., 2016; White et al., 2016). In older adults, but particularly in older adults with MCI, SDB can have a significant impact on cerebral oxygenation and the severity of associated cognitive and behavioral symptoms. In individuals without SDB, the average oxygen saturation (SaO2) during sleep approaches the lower limits of normal (Gries & Brooks, 1996) with age. In individuals with SDB, SaO2 levels often fall and can remain at levels well below autoregulatory control (i.e., ≤91%) (Gupta, Menon, Czosnyka, Smielewski, & Jones, 1997). In addition, the repetitive arousals associated with desaturations are known to cause profound fluctuations in cerebral blood flow (Balfors & Franklin, 1994), which can damage the microvascular endothelium, disrupt regulation of cerebral blood flow, and leave the brain vulnerable to hypoxic injury. Consistent with the impact that hypoxia has on brain oxygenation and function, many studies report significant associations between the severity of desaturations and cognitive impairment in older adults with SDB (Blackwell et al., 2015; Yaffe et al., 2011) and MCI (Kim et al., 2011; Terpening et al., 2015). Near-infrared spectroscopy (NIRS), which measures percent oxyhemoglobin saturation within the small vessels of the cortex, is a promising technology for evaluating the effect of CPAP on cerebral blood flow and oxygenation during sleep in older adults. Due to its high-energy demand and relative lack of glycogen fuel reserves, the brain relies on circulating oxyhemoglobin to generate adenosine triphosphate, a molecule of prime importance to the survival and efficient function of neural tissue. On average, the brain extracts between 20% and 40% of the available oxygen from the blood passing through it, leaving a sizable pool of oxygen to draw from (Derdeyn et al., 2002). Under normal circumstances, regional cerebral oxygen does not fall because the cerebral vessels are capable of regulating regional blood flow to accommodate changes in perfusion and arterial oxygen content, a mechanism referred to as autoregulation (Toth, Tarantini, Csiszar, & Ungvari, 2017). In addition to hypoxia, the resulting declines in regional flow can lead to further cell damage by disrupting the removal of potentially damaging byproducts (e.g., oxygen-free radicals, carbon dioxide, proinflammatory factors) generated by these working cells (Zlokovic, 2011). With age, however, regional cerebral oxygenation declines because regional blood flow declines while metabolism remains essentially unchanged between ages 40 and 75 (Lu et al., 2011). Characterized by diminished functional hyperemia across multiple brain areas, this noted decline in resting cerebral oxygenation is believed to represent a state of diminished vascular support for neural processing (Toth et al., 2017). In studies using NIRS, these age-associated declines in cerebral oxygenation can be found in the frontal lobes during cognitive testing (Bierre, Lucas, Guiney, Cotter, & Machado, 2017; Sakatani, Tanida, & Katsuyama, 2010) and sleep (Carlson, Neelon, Carlson, Hartman, & Bliwise, 2011; Carlson, Neelon, Carlson, Hartman, & Dogra, 2008). In the current authors' studies (Carlson et al., 2011; Carlson et al., 2008), regional cerebral oxyhemoglobin levels during sleep typically ranged between 60% and 80% in younger adults (ages 20 to 40), 55% and 70% in older adults (ages ≥65), and 45% and 55% in older adults with MCI. In addition, laterality (right- to left-sided differences) in cerebral oxygenation (L-COX) during sleep may be a marker in individuals with advanced vascular disease, and if not treated, a predictive marker of worsening of MCI symptoms and progression to dementia. L-COX has been reported with silent carotid disease (Jonsson, Lindstrom, Wanhainen, Djavani Gidlund, & Gillgren, 2017) and surgically induced cerebral ischemia (Calderon-Arnulphi et al., 2007). Relevant to MCI related to Parkinson's disease and Lewy body dementia, L-COX has been induced during pharmacologically induced manipulations in adrenergic modulation of cerebral blood vessels (Kim, Yoon, Lee, Yoon, & Kim, 2013). In young adults (Leon-Carrion et al., 2008), L-COX has been associated with slowing of processing, especially at higher task demands . The current study explored the possible associations between severity of SDB symptoms and L-COX measured over two consecutive nights, and clinical symptoms in 16 adults with neurologist-verified MCI. Based on comparisons across nights in the same individuals, findings suggest that frontal L-COX may be a useful mechanistic marker linking the severity of SDB symptoms to the severity of clinical symptoms in MCI. Community-dwelling adults age 50 and older were recruited from a memory clinic affiliated with a major medical center in the Midwest. All participants had undergone a neurological assessment for amnestic MCI, including diagnostic magnetic resonance imaging (MRI), in the past 3 months by a board-certified neurologist. Of 50 individuals deemed eligible, 26 were invited to participate. Ten declined due to disinterest (n = 4), scheduling conflicts (n = 4), or because they were found on study screening to have a health problem (severe depression and acute psychotic episode) that required immediate hospitalization (n = 2). The remaining 16 individuals underwent a second neurologist assessment, were deemed eligible, and within 2 weeks of the study screen, underwent the study protocol. The institutional committee for the protection of human participants approved the study. All participants gave informed consent. Inclusion and Exclusion Criteria. At the time of assessment and screening, individuals were required to meet the Petersen (2007) criteria for amnestic MCI, which include memory loss for at least 3 months that was not associated with significant functional decline. Memory loss was verified by a score of 24 to 29 of a possible 30 points on the Mini-Mental State Examination (Folstein, Folstein, & McHugh, 1975), with at least 1 point lost on the recall sub-scale. Two criteria, a Lawton IADL Scale (Lawton & Brody, 1969) score of 13 to 15 of a possible 16 points and a Clinical Dementia Rating Scale (Morris, 1993) score ≤0.5 points, were used to verify significant functional decline. MCI behavioral symptoms (yes/no) were recorded using the Neuropsychiatry Inventory (Cummings et al., 1994). For purposes of cognitive testing, participants were required to speak English and have completed at least 12 years of formal education. Participants were required to score positive (two or more categories endorsed) on the Berlin Sleep Apnea Questionnaire (Netzer, Stoohs, Netzer, Clark, & Strohl, 1999), which was later verified from their polysomnogram (PSG) recordings. The Pittsburgh Sleep Quality Index (Buysse, Reynolds, Monk, Berman, & Kupfer, 1989) was collected to assess participants' typical sleep patterns. Current alcohol intake was minimal (less than two alcoholic beverages per day). Review of the T1- and T2-weighted MRI scans verified the absence of stroke, brain tumor, or significant white matter disease (WMD) (≤2 of a possible 4 points on the Age-Related White Matter Changes Scale [Wahlund et al., 2001]). Because anemia influences oxygen carrying capacity, participants were required to have total hemoglobin levels >12 g/dL for women and 13 g/dL for men. Vitamin B12 levels were >300 pg/mL; ferritin levels were between 100 μg/L and 300 μg/L. All participants were nonsmokers for at least 5 years. All participants were taking donepezil and prescribed antidepressant agents; however, no participants had taken tranquilizers, anxiolytics, or recreational drugs for at least 6 months before testing. Concurrent illness, such as history of substance use, chronic obstructive pulmonary disease, diabetes, heart failure, renal insufficiency, cancer, concussion/loss of consciousness in the past 10 years, dementia, seizure disorder, bipolar disorder, or schizophrenia, excluded individuals from participating. Prestudy Health Screen. At the time of the study, all participants denied having a cold or flu, or taking antihistamine or sedative hypnotic agents in the past 1 week. All participants denied traveling across more than two time zones in the past week. Participants were also normotensive (systolic blood pressure 110 mmHg to 150 mmHg) and afebrile. Prestudy resting awake arterial oxyhemoglobin saturation was >95%. The studies were performed on two consecutive nights in a hospital-based sleep disorder center by a certified sleep technologist (J.D. ), under the direction of the medical director (K.J.). Between study nights, participants were asked to maintain their typical daytime routines between when they left the unit and returned at 7 p.m. Wrist actigraphy (Philips Respironics Actiwatch L) verified that participants did not nap. During the first 10 minutes of recording, participants lay quietly with eyes closed and lights on. After an uninterrupted 10-minute period of wakefulness, lights were turned off and participants were instructed to fall asleep. Lights out occurred between 9 p.m. and 10 p.m. At 6 a.m. the next morning, the recording was stopped, sensors were removed, and participants left the research unit. Recording periods ranged from 6 to 7 hours. Instrumentation. All PSGs (Embla RemLogic™ 3.4) met the standards set by the American Academy of Sleep Medicine (AASM) (Berry, Brooks, & Gamaldo, 2016) and included eight channels of electroencephalography (EEG) (F3-, F4-, C3-, C4-, P3-, P4-, O1-, O2-), as well as two channels each of eye movement and submental electromyography. Arterial oxyhemoglobin saturation (SaO2) was measured every 0.33 seconds with a Nellcor™ pulse oximeter. Airflow at the nose and mouth was monitored with a single channel oronasal thermocouple. Nasal air pressure was measured with nasal cannula connected to a pressure transducer. Respiratory effort, chest and abdominal, was recorded with a respiratory inductance plethysmograph (RIP). Simultaneous left- and right-side measures of percent cerebral oxyhemoglobin saturation (rcSO2) were collected by an INVOS™ 5100 Cerebral Oximeter. The INVOS sensors were applied to the forehead, 2 cm above the eyebrows and 2 cm to the left and right of midline, at approximately Fpz1 and Fpz2. The rcSO2 measures were collected every 4 seconds and were merged with participants' PSG data using computer time stamps after data collection. Sleep-Disordered Breathing. PSG recordings were scored by two certified raters (B.W.C., J.D.) who were blind to rcSO2 data. Using standard scoring rules, raters identified sleep onset and scored each subsequent 30-second epoch into one of four states: Stage 1 & 2 NREM sleep, Stage 3 & 4 NREM sleep, REM sleep, and Wake After Sleep Onset (WASO). Apneas, hypopneas, desaturations, and EEG arousals were also scored using standard criteria set by the AASM (Kapur et al., 2017). Apneas were defined by at least a 90% decline in airflow and chest/abdominal movements (RIP) lasting at least 10 seconds. Hypopneas were identified based on a >30% decrease in amplitude and lasting at least 10 seconds in the nasal air pressure and RIP channels, followed by either SaO2 desaturation ≥3% or an arousal. Mean SaO2 during sleep and percentage time asleep with SaO2 values <88% were calculated using RemLogic 3.4 software. A respiratory distress index (RDI) was calculated using the following formula: sum of apneas + hypopneas per hour of sleep. An RDI ≥5 on either Night 1 or Night 2 identified individuals with SDB. Sleep duration was determined by calculating the time in minutes the participant was asleep, beginning with lights out and ending with lights on. Laterality in Cerebral Oxygenation. Comparing the time stamps on the rcSO2 to participants' PSG recordings, the start of lights out was identified and, for each subsequent epoch, the mean of left and right rcSO2 values (rcSO2Left+Right/2) and the absolute mean difference in right-left sided (|rcSO2R–L|) values were calculated. Because instrument error for the INVOS 5100 is ±1% (access http://www.somanetics.com), errors in measured difference in rcSO2 vary between 2% and 4%. In the current authors' prior studies of cognitively intact community-dwelling adults, right-left sided measures remained below 2% (Carlson et al., 2011; Carlson et al., 2008). Thus, L-COX was defined as an absolute mean difference in rcSO2 of >4%. Agreement for scoring respiratory events was good for identifying epochs containing apneas/hypopneas (Kappa ≥ 0.95), desaturations (Kappa ≥ 0.97), and EEG arousals (Kappa ≥ 0.80). Interrater agreement for differentiating between epochs of sleep and wakefulness (Kappa ≥ 0.91) and between epochs of NREM and REM sleep (Kappa ≥ 0.89) was within acceptable limits. In three participants, the amplitude of the EEG was so small that Kappa or scoring NREM sleep (Stage 1, Stage 2, and Slow Wave Sleep) was <0.70. To minimize the effects of scoring error, NREM segments were collapsed into one category, focusing the analysis on segments of wake, NREM, and REM sleep. Initial review of the sleep records revealed that no participants met criteria for SDB on both nights. Thus, the order of nights was ignored and paired Student t tests were performed to examine within- and between-night differences in the following variables commonly used to characterize the severity of SDB: (a) sleep duration, (b) mean percent arterial SaO2 for all epochs of sleep, (c) percentage of time scored as sleep with SaO2 <88%, and (d) frequency of desaturations (4% drops in SaO2 of at least 20 seconds' duration) per hour of sleep. Because brain metabolism and cerebral blood oxygenation vary by stage of sleep and between sleep and wake (Madsen & Vorstrup, 1991), L-COX measures were averaged within each stage of sleep. Student t tests were used to examine differences within epochs of NREM, REM, and WASO across nights. Relationships between L-COX and SDB severity and daytime function (scores on the MMSE, Lawton IADL Scale, and Epworth Sleepiness Scale) were tested using Spearman rho correlations. All analyses were performed using SAS version 9.3. Although meeting study criteria at their last clinic visit, four participants did not meet criteria for MCI at the study screen. Three participants attained perfect scores on the MMSE (30 points) and one participant progressed to Alzheimer's dementia (MMSE <24 and required assistance with IADLs). Four additional participants were excluded from analysis because they did not meet criteria for SDB on either night. The remaining eight participants with SDB were men (n = 5) and women (n = 3) between ages 57 and 86 years (mean age = 70.6, SD = 8.8 years). Although participants were required to miss points on the memory portion of the MMSE, six participants missed at least one non-memory item. Scores on the Lawton IADL Scale ranged from 14 to 16 points. Four participants had scores of 14, indicating that they required some assistance with one or two IADL. Reported behavioral symptoms in the past 1 month, detected with the Neuropsychiatric Inventory, uncovered several concurrent non-cognitive symptoms, including irritability (n = 5), motor disturbances (n = 5), acting out dreams (n = 5), depression and anxiety (n = 4), agitation (n = 2), hallucinations (n = 1), and apathy (n = 1). All eight participants denied symptoms such as increase or decrease in appetite, delusions, elation or euphoria, or disinhibition. All participants had at least one risk factor for cerebrovascular disease. Five participants had hypertension, which was controlled with medications. No participants were actively being treated for diabetes, but three had A1c levels between 6 mg/dL and 7 mg/dL. No participants had A1c levels >7 mg/dL. All participants had a history of hyperlipidemia, but only five were taking medications. MRI scans showed that all participants had minimal to mild amounts of cortical atrophy. Three participants had noticeable hippocampal atrophy on MRI. WMD was absent in one, mild (WMD score = 1/4) in three, and moderate (WMD score = 2/4) in four participants. Table 1 compares sleep and respiratory parameters across nights, with and without SDB. Frequency of 4% desaturations and apneas/hypopneas per hour of sleep were significantly higher on the nights with SDB. The severity of desaturations, as measured by mean peripheral SaO2 and percentage of time spent with SaO2 <88%, were also significantly greater on the nights with SDB. 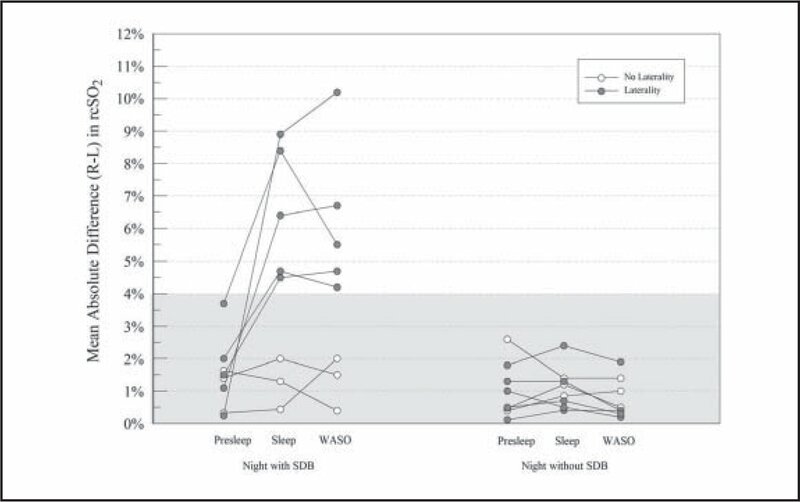 Average rcSO2 or amount of sleep (total sleep time, latency, and WASO) did not differ between nights with and without SDB. Figure 1 illustrates the differences in right- and left-sided L-COX measurements on nights with and without SDB. The shaded area represents the margin of error for the device (4%). Each symbol represents data from one participant. On nights with SDB, presleep L-COX levels were below the margin of error for the instrument (range = 0.25% to 3.7%). 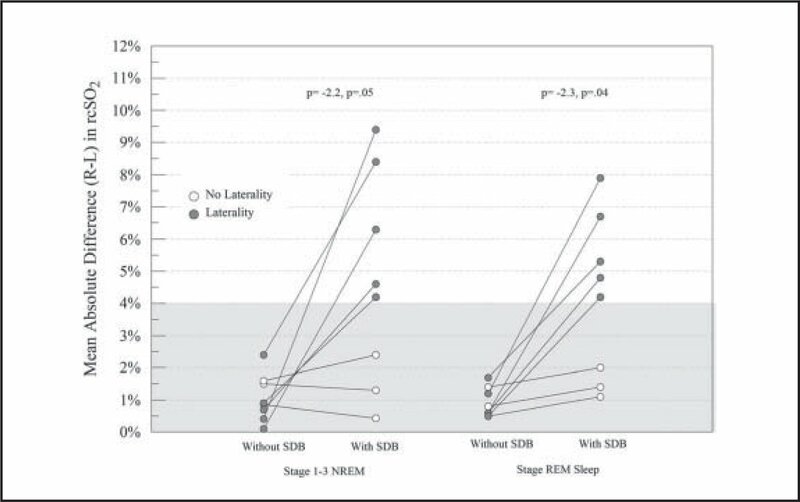 After falling asleep, differences in right- and left-sided measures on nights with SDB remained below 4% in three participants during sleep (range = 0.5% to 2%) and upon awakening (range = 0.4% to 2%). The remaining five participants exhibited L-COX with SDB. On the nights with SDB, right- and left-sided measures differed by as much as 4.5% to 8.9% during sleep and 4.2% to 10.2% upon awakening. Shown on the far right of Figure 1, L-COX was absent (i.e., differences were <4% on nights without SDB). Laterality in cerebral oxygenation (L-COX) 5 minutes before sleep onset (presleep), during sleep, and at wake after sleep onset (WASO). Indicated by a mean absolute difference in rcSO2 ≥4%, L-COX was noted in five of eight participants. Each circle represents data from one participant. Open circles signify the three participants without L-COX. Filled circles signify the five participants with L-COX. In these five participants, L-COX was seen during sleep and at WASO. Regardless of the stage of sleep, the differences in right- and left-sided rcSO2 values were significantly greater on nights with SDB (Figure 2). During NREM sleep, averaged differences on nights with SDB were 3.63% (SD = 2.91%) compared with 1.25% (SD = 0.91%) on nights without SDB (Wilcoxon t approximation = −2.2, p = 0.05). With differences ranging between 1.41% (SD = 0.82%) and 3.43% (SD = 2.93%), greater L-COX was also observed during REM sleep (Wilcox-on t approximation −2.3, p = 0.04). Laterality in cerebral oxygenation (L-COX) during NREM and REM sleep on nights with and without sleep-disordered breathing (SDB). Each circle represents data from one participant. Open circles signify data from participants without L-COX. Filled circles signify data from participants with L-COX. L-COX was present in REM and NREM sleep on nights with SDB. Mean rcSO2 decreased with age (r = −0.83, p = 0.01), but age was not associated with L-COX (r = 0.45, p = 0.26). Overall, greater L-COX was significantly associated with greater daytime sleepiness (Epworth Sleepiness Scale: r = 0.85, p < 0.01) but not self-reported sleep quality (Pittsburgh Sleep Quality Index: r = −0.02, p > 0.05). On nights with SDB, greater L-COX was associated with more apnea/hypopneas per hour of sleep (r = 0.66, p < 0.01) and longer time spent asleep (r = 0.50, p = 0.05). Although L-COX was not associated with average SaO2 (r = −0.28, p = 0.29), greater L-COX was associated with increased severity of desaturations, including more desaturations per hour of sleep (r = 0.73, p < 0.01) and more time spent with SaO2 values <88% (r = 0.65, p < 0.01). Table 2 shows the characteristics of participants with and without L-COX (L-COX ≥ 4%). Overall, greater L-COX was significantly associated with lower scores on the MMSE (r = −0.76, p = 0.03) and Lawton IADL Scale (r = −0.83, p = 0.02). Behavioral symptoms were more common in participants with L-COX (4.4 versus 1.8 symptoms of a possible 12 symptoms). All participants with L-COX reported irritability, acting out dreams (i.e., REM sleep disorder), and motor disturbance. Some participants with L-COX also reported agitation and hallucinations. Participants without L-COX did not report any of these symptoms. Although associated with L-COX, the frequency of apnea/hypopneas per hour of sleep and the two measures of desaturations were not associated with scores on the MMSE, Lawton IADL Scale, or Epworth Sleepiness Scale. Perhaps reflecting the severity of ischemia or ischemic events, greater L-COX was associated with greater mild to moderate WMD (r = 0.82, p = 0.01). Although participants with and without L-COX had moderate cortical atrophy on MRI, hippocampal atrophy was most pronounced in those without L-COX. Review of clinical records revealed that all three participants without L-COX had hypertension and hyperlipidemia. Two participants had A1c levels consistent with insulin resistance. Only two of five participants with L-COX had hypertension, hyperlipidemia, or insulin resistance. Participants without L-COX had higher body mass indices (BMI) than those with L-COX (mean BMI = 27.8 kg/m2 versus 25.3 kg/m2). Specifically, BMI of participants with LCOX fell within the upper range of normal in one participant (BMI = 24.9 kg/m2) and within the range for mildly obese (30 kg/m2 and 31.5 kg/m2, respectively) in two participants. In participants with L-COX, BMI was normal (18.9 kg/m2 to 24.9 kg/m2) in one participant and overweight (25 kg/m2 to 29.9 kg/m2) in the remaining four participants. The association between SDB severity and L-COX was studied in a small sample of adults with MCI. The severity of SDB was found to vary from one night to the next, which provided a unique opportunity to examine how L-COX during sleep varies by the severity of SDB symptoms within the same person over time. Greater severity of SDB (apnea/hypopnea index) and desaturations (frequency of desaturations >4% and time spent with SaO2 levels <88%) on nights with SDB were associated with greater frontal L-COX. Greater L-COX was associated with lower daytime functional abilities, more global cognitive impairment, and more excessive daytime sleepiness, but the severity of SDB and desaturations were not associated with these variables. Although based on a small sample, the current findings have several implications for practice and research. The first implication involves the challenges of using sleep laboratory studies to screen for SDB in individuals with MCI. All eight participants with SDB showed significant night-to-night fluctuations in all three standard indices used to diagnose SDB. Seven participants met SDB criteria on Night 2; only one participant (with amnestic MCI) met SDB criteria on Night 1. Such findings bring into question the adequacy of split-night and one-night studies for diagnosing SDB in individuals with MCI. Recent guidelines published by the AASM (Kapur et al., 2017) suggest that home sleep apnea testing is not as sensitive as laboratory assessments for grading the severity of SDB. It is, however, a viable option for grading the severity of desaturations (Maziere et al., 2014), a variable that the current findings suggest may be mechanistically related to L-COX. Given the difficulties with scoring sleep from the EEGs of individuals with MCI, home sleep apnea monitoring systems that measure airflow, arterial desaturations, and L-COX may be sufficient to identify individuals who could benefit most from CPAP and other treatment modalities for SDB. A second implication is the potential use of L-COX as a predictive marker for initiating CPAP and titrating CPAP prescriptions in individuals with MCI. Measures such as SaO2 provide only an estimate of the adequacy of the lungs to take in oxygen and the amount of oxygen that is delivered to the cells of the body. By reflecting the amount of oxygen within the microvessels of the brain, rcSO2 provides an organ-specific measure of the adaptive capacity of the neurovascular unit (i.e., microvessels and associated glial cells) to match regional flow with metabolism. Unlike any of the measures of SDB severity, L-COX was the only variable associated with lower cognitive function and greater need for assistance in performing IADL. The relationship between L-COX and daytime symptoms and white matter pathology aligns well with the growing literature that points to the impact of comorbid vascular disease on the severity of cognitive symptoms in individuals with neurodegenerative disorders. Reported in 1997, the Nun Study was the first to describe the increased risk of dementia in individuals with Alzheimer's neuropathology and cerebral infarcts (Snowdon et al., 1997). Depending on the locations, individuals with both conditions were four to 20.7 times more likely to develop dementia than those without infarcts. Individuals with the greatest deficits had lacunar infarcts in areas that affect arousal, namely the basal ganglia, thalamus, and DWM. 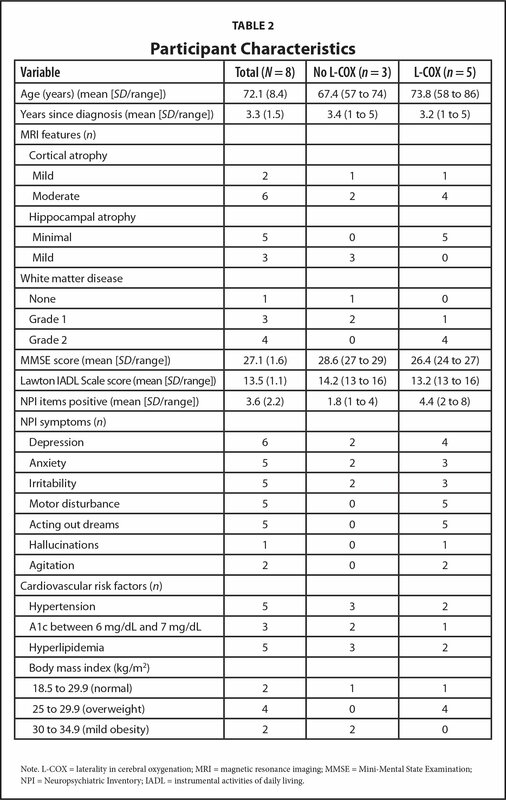 Since this initial report, the list of neuropathological abnormalities increased to include hippocampal sclerosis and neocortical Lewy bodies in the list of predictive markers of late-life cognitive impairment and dementia (White et al., 2016). In individuals with MCI, persistent L-COX may be a key predictive marker of vascular MCI because it can be found in individuals with silent carotid disease (Jonsson et al., 2017) and surgically induced cerebral ischemia (Calderon-Arnulphi et al., 2007). To explore how night-to-night changes in SDB severity (i.e., desaturations, arousals, and RDI) may induce states of diminished vascular support in individuals with MCI, the current authors used MRI to purposefully exclude individuals with advanced cerebrovascular pathology, a major confounder that is seldom controlled for in CPAP trials. In doing so, it was found that L-COX varies across nights, but in this small sample was present only on nights with SDB. On nights with SDB, L-COX was greatest in participants who spent more time with SaO2 levels <88%. Although more work is needed to determine the sensitivity of L-COX in tracking changes in SDB severity, the current results suggest that in individuals without advanced cerebral vascular disease, L-COX may be useful for grading the severity of SDB and have potential use for titrating CPAP in patients who have MCI and SDB. Although promising, more work is needed to examine the prevalence and severity of SDB and its impact on L-COX in different subpopulations of MCI, including MCI that precedes dementia with Lewy bodies (DLB) (Molano et al., 2010). As with amnestic MCI, DLB has a prodromal period of 10 years, but there is a comparatively short period (1 to 3 years) between the recognition of MCI and the development of dementia (Molano et al., 2010). Relevant to the work by Molano et al. (2010), transient laterality in cerebral blood flow, as measured with arterial spin labeling, was a prominent feature differentiating individuals with DLB-MCI from amnestic MCI and healthy aging (Roquet et al., 2016). In the current study, patients with MCI with L-COX reported behavioral symptoms consistent with DLB-MCI. Although definitive conclusions cannot be drawn from the current pilot study, findings suggest that individuals with desaturations during sleep, and particularly individuals with DLB-MCI, could benefit from treatments that regularize breathing, support cerebral blood flow, and prevent/avoid declines in arterial oxygenation. Despite the compelling implications, the current study has several limitations. Although there were no statistically significant associations between apnea/hypopneas and desaturations and daytime function, the absence of these associations may be due to the small sample size. Thus, the interactive or independent effects of these variables with L-COX on daytime function cannot be ruled out. Although the findings offer avenues for investigating mechanisms and effectiveness of treatments, the authors' next step is to conduct a study with a larger sample of patients with MCI (amnestic MCI, DLB-MCI, and vascular MCI), with and without SDB. Moreover, this was a cross-sectional study, which does not permit assessment of any temporal association between SDB, L-COX, and daytime function, and thus precludes any determination of causal order. Because there was no intervention, there may be no direct causal link between SDB, L-COX, and MCI symptomology. Rather, each may arise from a third, shared disease process. Prospective studies in humans with larger samples and additional experimental work examining the effects of CPAP and similar treatments in individuals who are carefully classified by MCI symptoms are needed to further the understanding of the mechanistic linkages between SDB, L-COX, and daytime symptoms, including the progression to frank dementia, in this vulnerable population of older adults. Although SDB is a common predictor of MCI, L-COX in individuals with SDB may be a better predictor of the severity of MCI symptoms. Because a number of individuals with MCI have comorbid cardiovascular disease, near-infrared spectroscopy provides clinicians with a simple, noninvasive tool for titrating cerebral oxygen–sparing interventions at a stage when interventions may prove most effective for forestalling cognitive loss. Berry, R.B., Brooks, R. & Gamaldo, C.E. (2016). The AASM manual for the scoring of sleep and associated events: Rules, terminology and technical specifications (2.3 ed.). Darien, IL: American Academy of Sleep Medicine. Cooke, J.R., Ayalon, L., Palmer, B.W., Loredo, J.S., Corey-Bloom, J., Natarajan, L. & Ancoli-Israel, S. (2009). Sustained use of CPAP slows deterioration of cognition, sleep, and mood in patients with Alzheimer's disease and obstructive sleep apnea: A preliminary study. Journal of Clinical Sleep Medicine, 5, 305–309. Kim, E.M., Yoon, K.B., Lee, J.H., Yoon, D.M. & Kim, D.H. (2013). The effect of oxygen administration on regional cerebral oxygen saturation after stellate ganglion block on the non-blocked side. Pain Physician, 16, 117–124. Madsen, P.L. & Vorstrup, S. (1991). Cerebral blood flow and metabolism during sleep. Cerebrovascular and Brain Metabolism Reviews, 3, 281–296. Dr. Carlson is Robert and Doris Klabzuba Professor of Nursing Science and Assistant Director of Translational Science, Donald W. Reynolds Center for Nursing Geriatric Excellence, Mr. Carlson is Retired Senior Statistician, and Dr. Craft is Associate Professor and Interim Associate Dean for Academic Administration and Graduate Education and Director, PhD Program, Fran and Earl Ziegler College of Nursing, and Dr. Coleman-Jackson is Advanced Practice Nurse, and Dr. Hershey is Retired Professor, Department of General Neurology, College of Medicine, University of Oklahoma Health Sciences Center; Dr. Jones is Associate Professor of Medicine and Program Director, Sleep Medicine Fellowship Program, and Dr. Duke was Certified Sleep Technologist, Sleep Laboratory, The Children's Hospital, University of Oklahoma Medical System, Oklahoma City, Oklahoma. The authors acknowledge the generosity of the individuals and caregivers who have taken the time to volunteer and rearrange their lives to help with this investigation. The authors thank the undergraduate students (now graduates of University of Oklahoma) who were instrumental in data collection: Mr. Shaylin Daji, Ms. Kelley Deardeuff, and Ms. Kaitlin Curran. Address correspondence to Barbara W. Carlson, PhD, RN, Robert and Doris Klabzuba Professor of Nursing Science and Assistant Director of Translational Science, Donald W. Reynolds Center for Nursing Geriatric Excellence, Fran and Earl Ziegler College of Nursing, The University of Oklahoma Health Sciences Center, PO Box 26901, 1100 N. Stonewall Avenue, Oklahoma City, OK 73117; e-mail: Barbara-Carlson@ouhsc.edu.